It was on the street in front of Hotel Margarita that we met German Medina Nieto. He was standing in a Miami Dolphins jacket by a Chevrolet truck on which no two wheels matched. “I can show you the butterflies,” he offered in Spanish. We told him that we had already been to the reserves and that they're closed for another week. “Yes, but I know a place where the butterflies are,” he said. “I'll take you there and if you don't see thousands of butterflies you don't have to pay me.” He flashed his laminated credentials from the tourism office that certified him as an official butterfly guide and motioned to a hand-painted title across the cab of his truck “Transporte a la Monarca.” We accepted and set up a time to meet him the next day. Promptly at 7 a.m. the next morning, German was parked in front of our hotel. We took a rough and winding ride up a narrow street that took us above the town and past a cemetery. As we drove German told us, in Spanish, the story of “Las Mariposas Monarcas.” “There are many kings among the butterflies, but only one monarch,” he informed us. Conditions in the central Mexican highlands are perfect for the insects, with cool temperatures and plenty of milkweed plants to feed on. The journey they make is nearly 6,000 kilometers, often traveling up to 130 kilometers a day. 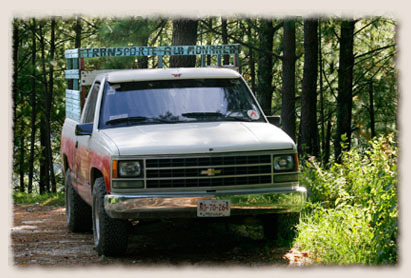 German stopped the truck as the road entered a tree-lined area and we continued on foot. “This is the butterfly sanctuary,” he told us, adding “And this is my sanctuary.” The mountains around Angangueo and their butterflies have become a refuge for German. A 53-year-old former miner, he told us of the hot, dark and dangerous work with a pick that took place nearly 600 meters below the earth's surface, his rough and large knuckled hands with their fingernails grubbed off short corroborated his story. Angangueo is a former mining town, founded by the Spanish in an area with few indigenous people, requiring the Europeans to bring their own to search for the lead, iron and silver buried in the hills. German, with his narrow face and long nose, is a direct descendant of the Spanish miners. “My grandparents had blue eyes,” he told us proudly. But the mines went bust in the 1970s and many of Angangueo's residents fled to the larger cities in search of work. A widower with two children, German had no choice but to stay behind. But as the mining economy vanished Fred Urquhart appeared. A Canadian entomologist, Urquhart devoted his life to studying the monarch migration patterns and brought notoriety and tourism to the hills around Angangueo. German whispers his name, as if he were a saint. It was Fred Urquhart who made German's life in Angangueo possible. Now German runs a hotel and uses his truck to take tourists into the hills. A brochure in town advertises Angangueo as “the model of sustainable tourism” and the town will see almost 10,000 tourists a day in the busiest part of the butterfly migration season in February. We paused in a clearing where German motioned to a pine tree. In the dawn light it would be possible to miss the light brown clusters that sagged the tree's branches, dead leaves on an evergreen. The clusters were thousands of sleeping monarchs and they filled half a dozen pines in the clearing. Looking down, the ground was littered with pieces of wings and whole dead butterflies, victims of predators and cold nights. German picked two up, cradling the tissue paper corpses in his large, rough hands as he showed us how to tell the difference between a male and female. 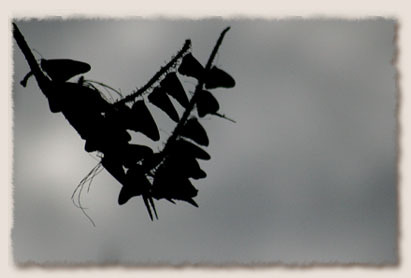 The monarchs with their wings closed could be mistaken for dead leaves hanging from tree branches. They remain asleep until the warmth of the sunlight reaches them. The male monarchs (right) have thinner black veins and a small black spot on their lower wings, where as the veins on the females are more pronounced. 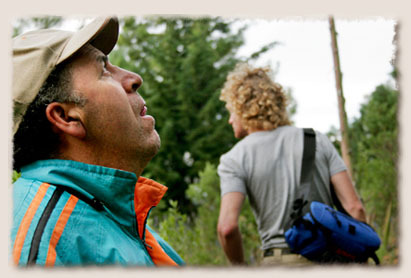 Our butterfly guide, German Medina Nieto, glances up at the pine trees full of butterflies. 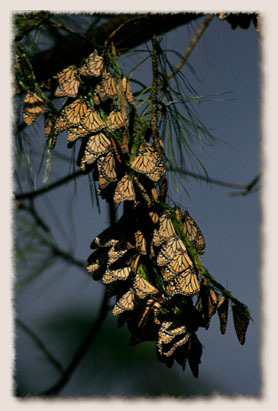 Sleeping clustered on a branch, the monarchs wait for the sun to rise before taking flight again. As the sun rose and the air got warmer, the brown clusters began to show specks of orange. 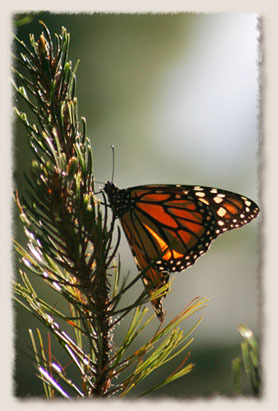 A monarch would awake, flutter its wings until it broke from the cluster and gently fall to the pine needle covered floor. In a reverse autumn, the monarch leaves became alive and dropped from the trees, the woods so quiet that you could hear them land. The sleep-groggy monarchs stumbled in circles in the grass and we took care not to step on them. As the sun continued to warm the hillside, the trees turned orange with the outstretched monarch wings and the butterflies that broke away took to the air rather than the forest floor. On some branches individual butterflies would separate like and glide like snowflakes. On others, whole clusters would explode in fury of beating wings. The monarchs filled the air like a flock of birds. German walks around picking up fallen butterflies in what he called "mi santuario." 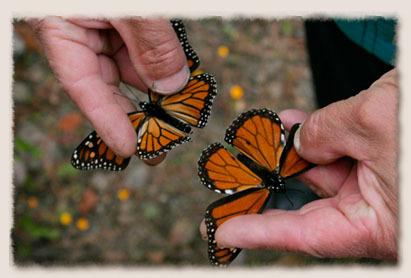 The butterflies in the Mexican mountains will mate and lay eggs that hatch in late spring. Fledgling monarchs fly north to the Great Lakes area to lay more eggs over the summer. 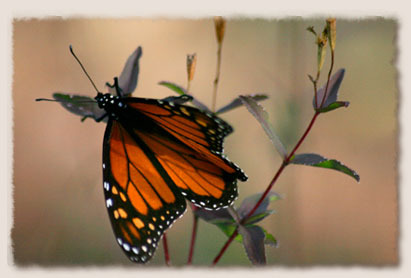 Monarchs born in Canada instinctively know to fly south to the sanctuaries, an area of only 160 square kilometers. Butterflies born in Mexico automatically fly north. “Es el misterio de las monarcas,” German said. High overhead a jet airliner from Guadalajara , speeding north to the U.S. , left a billowy contrail against a brilliant blue sky. 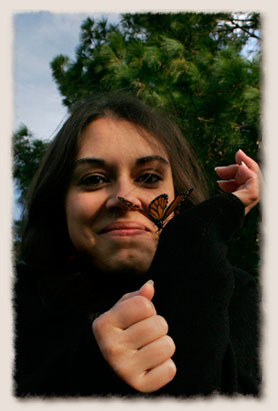 I realized that, as the monarch flies, Holly and I were over 2,000 miles from home. 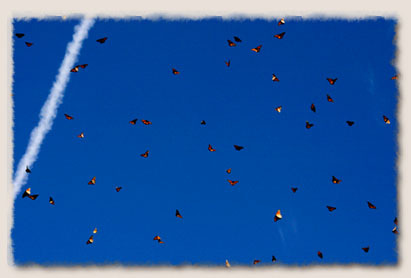 The sky is filled with monarchs as the sun reaches a peak in Angangueo. Holly looks to be enjoying the company of a monarch. 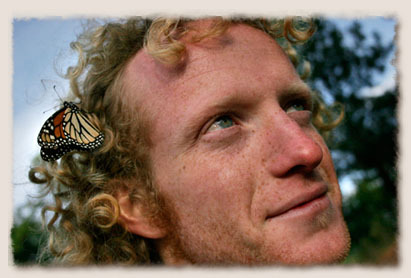 The same butterfly found refuge in Jeremiah's hair. German drove us back through the town square and up another narrow street that winds up the hills on the east side of town, pausing only to remove his hat and cross himself as we drove by the neighboring churches in the town square. 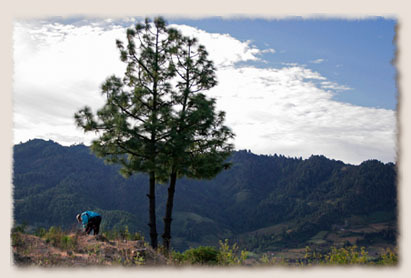 Overlooking Angangueo, he told us the story of the “dos templos.” It is a story typical of Mexican history. The large and elaborate Church of the Miraculous Conception was built by the wealthy Spanish mine owners with the money they had stripped from the surrounding hills. The smaller, but equally beautiful, church of San Tomas was built by the “others” in the town, the working class miners and merchants, after many years of scrimping and saving. As the street continued its nearly vertical climb, German stopped by a statue of a miner that celebrates Angangueo's heritage, success based on finding the treasure that resides in the surrounding hills. As we looked over the town that was still waking up, a voice called to German. Just down the street Simon Ramirez Franco poked his head out of his basement door. German asked us if we were hungry and we walked to the little restaurant in the bottom floor of Simon's house. We had a conversation in English, a skill that Simon, with his day-old beard and omnipresent grin, said he learned in the local schools, as he made a breakfast of quesadillas and coffee for the three of us. 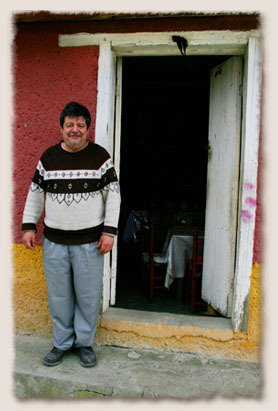 Our quesadilla chef Simon Ramirez Franco in front of his home/restaurant. Back at our hotel we thanked German and paid him. An hour later, as we headed out of Angangueo, we saw the beat-up Chevy truck parked along the street, a cardboard sign across the windshield offering butterfly tours, waiting to return to German's sanctuary. 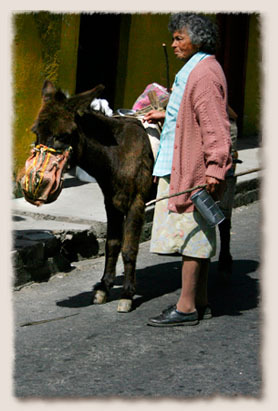 We passed by more of the local houses on our way out, like this woman who was using a donkey to carry some water back to her home. Many of the people in Angangueo decorated their front porches and stoops with colorful potted flowers. Flowers lined the curbs, stairways and balconies of their homes.